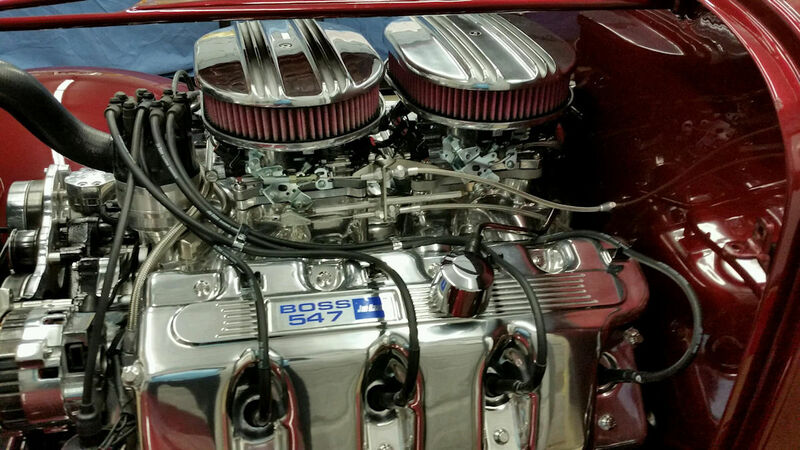 When Mike Leathers called up and asked EFI System Pro could provide him with a dual Holley Terminator EFI setup for the Boss 429 engine sitting in his '32 Ford, I said I thought it sounded like a great project. I had no idea how great this was going to be. Mike and I chatted about what was necessary to make this happen, and it sounded like a good fit. We probably spent more time talking about our shared experiences in sports car racing, him as a championship driver and me as a national-level tech inspector (read: marginally talented volunteer) than diving too deep into the weeds of the project. Mike said that Brandon over at Metal Union Speed Shop was going to taking the lead on this installation, and that his role would be following Brandon's instructions and putting the two of us together if there were any questions. I think that Brandon called once, mostly to confirm he had the phone number right and say hello. I don't recall any deep technical questions. Mike bought this car as a bare-metal rolling chassis back in 2006 and immediately started working on it. Mike brings a refreshing balance to the term "owner-builder". He enjoys touching every part of the car that he can but at the same time recognizes that there are professionals out there that are able to work magic. 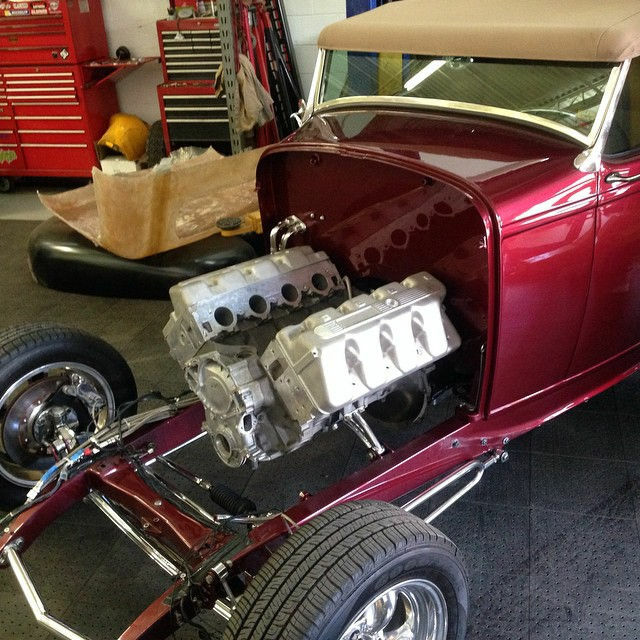 Rather than just hand this car off and ask for a call when it's finished, he personally manages the project's details and takes every opportunity to work side-by-side with the professionals. The results speaks for itself: A beautiful production that bears the customizing finger prints of its owner. It took only three years for Mike to get this car into championship form. This all-steel 32 Ford competed in 2009 in the World of Wheels in Atlanta, GA and won Georgia Top 10, Best Engine, and Best Street Roadster. It has been featured in more magazines that I can list, including this great article from the Summer 2016 issue of Street Rod Life. 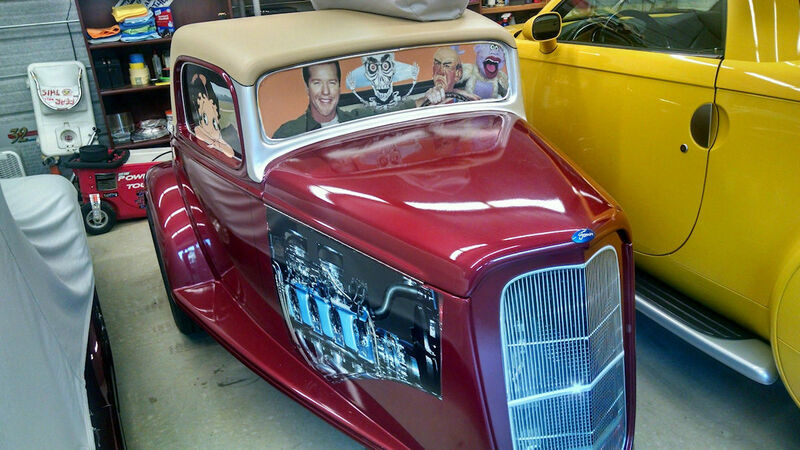 It was on My Classic Car television show with Dennis Gage. 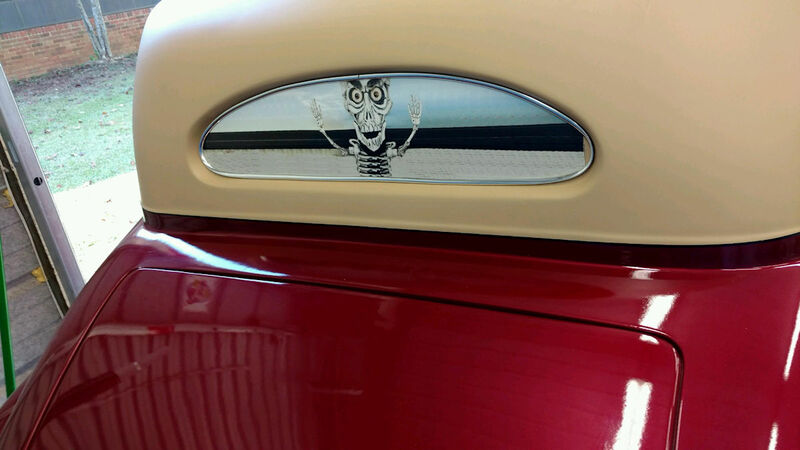 The article linked above goes into much more detail on the car than I'll try to cover here. 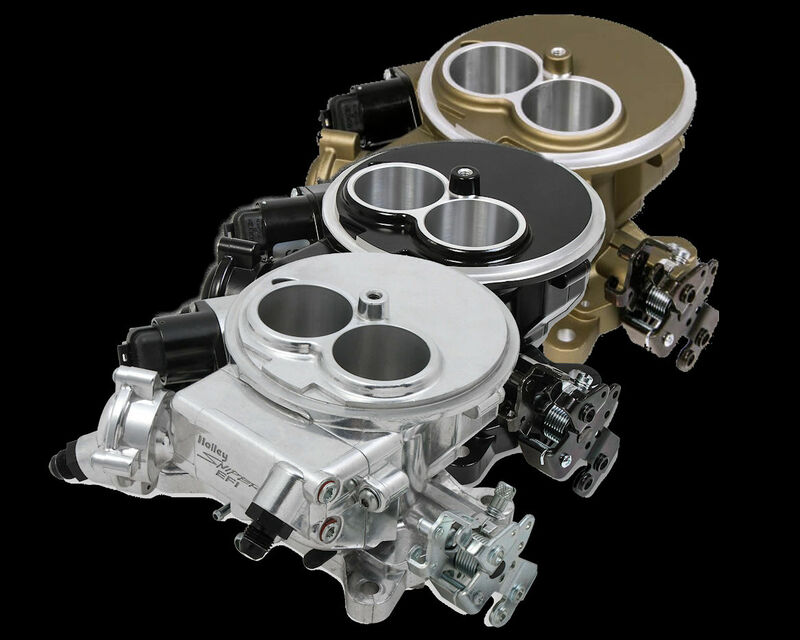 If you're reading this you're probably interested in one major element: the twin Termminator Throttle Bodies. I'll start by giving you a rundown of the essential required elements to make this work. Then I'll leave you with Mike's own assessment of the results. 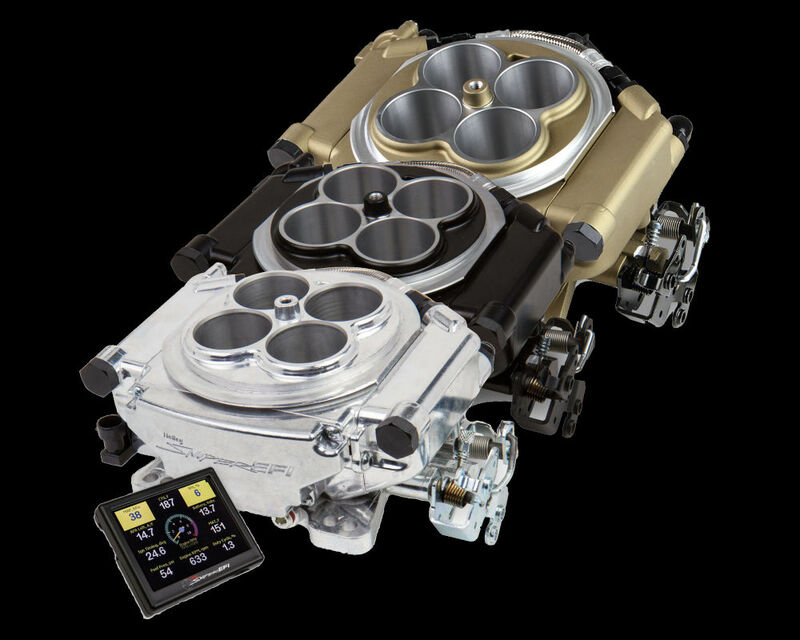 Holley has intended to offer a ready-to-install twin 4-barrel throttle body injection kit for some time. And they originally intended to do that with the Terminator EFI system, though there is now similar plans to introduce a twin Sniper EFI setup. However, at the time of this writing, neither is available for purchase as a 2x4 kit. Holley even went so far as to create a 2x4 harness for adding a second Terminator throttle body. 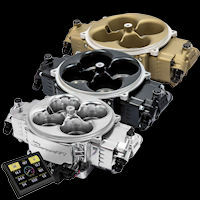 But the Terminator main harness included in the Terminator kits has only a connector for a single throttle body and no requisite connector for this additional injector harness. This means that to use it one has to add wiring and a connector for the four additional injectors driven by the 2x4 harness, buy a second main harness that has the 2x4 connector, or buy all of the components for the kit "ala-carte".. Modifying the kitted harness is not rocket science, but most folks would prefer not to have to go into this level of production for a system that costs somewhere at or above the $3000 mark. It is more than "some assembly required." There is a second issue as well. There is no provision in the setup wizard to add a second throttle body to the configuration. Again, not an overwhelming obstacle, but in a system that is promoted as one that allows owners to simply answer a few questions on the included handheld display and fire it up, it's more than they really want to handle. Here's where we come in. 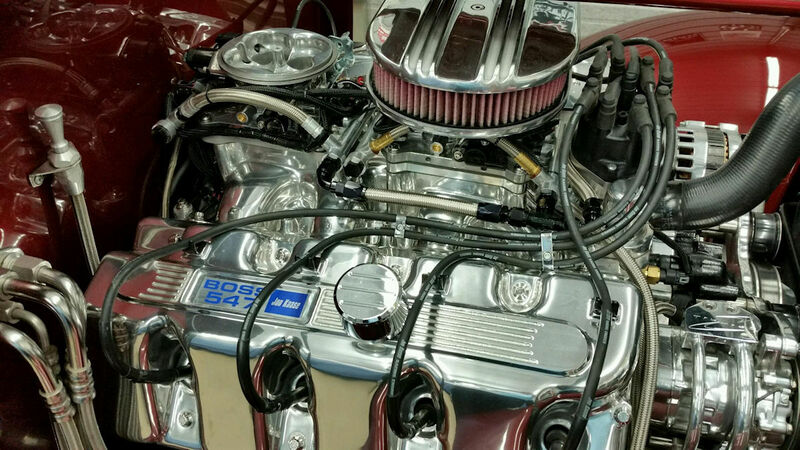 We kit exactly the components that Mike needed to have a complete system for his engine--the ECU, the throttle bodies, the additional harness, and even the fuel system components. Then, we professionally modify the main harness to add the pins, wiring, and connectors to mate to Holley's Termiantor 2x4 harness, re-assembling it to the same professional level of completion. Finally, we do the configuration setup here in our facility, so that when the kit arrives it should install and crank just like it did for Mike. "Drove to the GA Street Rod Association meet Saturday, about 75 miles one way. 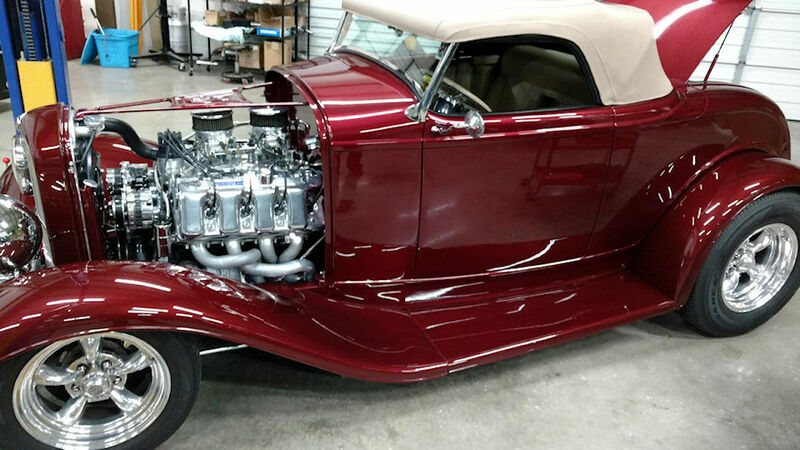 Before fuel injection, the mileage was 12.6 MPG. Now it's 15.7 MPG! The power is more responsive, the starting is instant, everything is fantastic. I had no idea how great it was going to be! Oh yeah, the car was picked as car of the month." 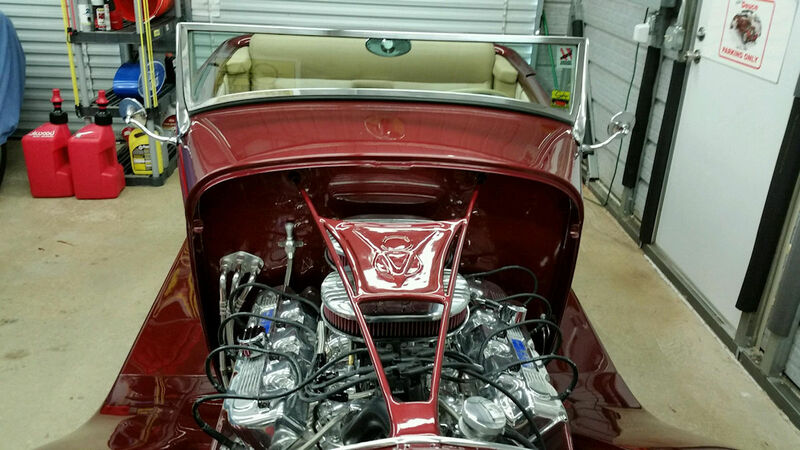 This on a 547 cubic inch Ford motor making 800 HP. There are plenty of folks out there looking to do twin four-barrels because, after all, they do look cool. But this engine actually uses much of that combined 1900 cubic feet per minute of flow that these dual throttle bodies produce. If you'd like to see this gorgeous car you certainly should find an opportunity. Mike takes it to many of the major car shows in the southeastern USA, including the Turkey Rod Run in Daytona Beach, Florida, Shades Of The Past in Pigeon Forge, Tennessee, and the Good Guys show in Nashville, Tennessee. Or you might spot him anywhere in between for that matter because he NEVER trailers this car--he drives this car, both around town and to shows in neighboring states In fact, it is so well-behaved that when he travels he pulls his own trailer with it, a doppleganger of itself with the Jeff Dunham characters looking out from the side and back windows. If you see this car you'll be sure to recognize it, even it it's not putting it's unique trailer. 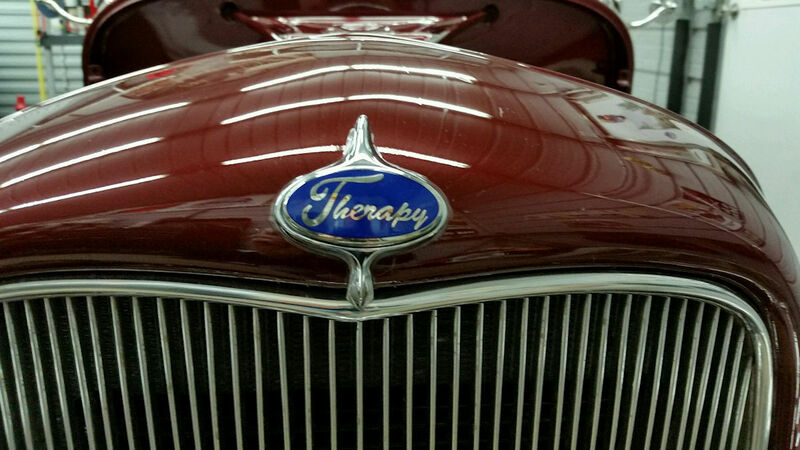 From the badge on the front to the "THRAPEE" license plate on the back, it's all about therapy. Adding the twin Terminator's simply makes the medicine that much smoother. 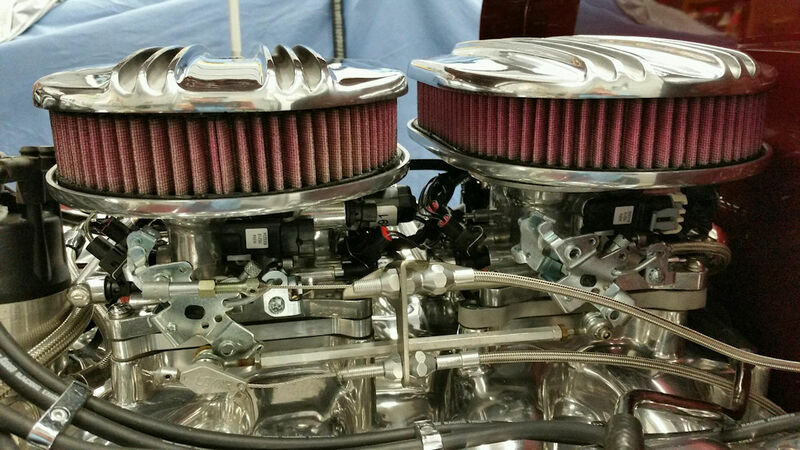 Are you interested in adding a Twin Terminator throttle body setup to your engine? Find out more here. Do you have a technical question or maybe want to pass on a comment to Mike about this great project? Post below! I look forward to answering your questions. Join the disucssion below or click here to see more amazing customer rides!